Hi– it’s Susie and Otto Collins and we’re the world’s leading experts on overcoming jealousy and we want to help you get rid of this ugly, nasty, embarrassing, relationship killing affliction know as jealousy. If you’re jealous, how bad is it? Have you ever lost a relationship because of your jealousy? Have friends, family members or co-workers talked about your jealousy (even jokingly) and you’ve denied it being a problem? Have you ever caused a fight or argument because you accused your spouse or partner of being with someone or having an affair when there’s no evidence to support your accusations? Have you ever caused a spouse or partner to pull back, withdraw or not want to be with you because of things you’ve said or done while having jealous thoughts? The tragedy for most people who are jealous is that they try to minimize the impact that jealousy is causing in their relationship or marriage and life—when it’s destroying everything around you that matters. Most people afflicted with jealousy can’t see that when they’re doing things like checking their spouse or partner’s cell phone to see who they’ve been talking to or texting with or things like driving by where they live or work to check up on them that these kinds of behaviors are a habitual way of thinking. In the case of out of control jealousy, not only will it destroy your relationship or marriage (usually much sooner than you might think)—but it will also destroy your future relationships as well. These kinds of behaviors only tend to agitate you and only continue to create an even bigger firestorm of fear and anxiety within you that your love is about to be taken away. Most people who are consumed by jealousy think that by driving by where your spouse or partner lives, driving past where they work to see if their car is there or by calling them over and over for no reason at all to make sure they’re doing what you thought they were supposed to be doing will make you feel better. But after working with hundreds of clients who are jealous—we can tell you that doing these kinds of things only makes things worse. Are you starting to see that your problems with jealousy are much bigger than you thought? Are you starting to see that you may not be able to get rid of your jealousy on your own? After all—if you knew how to stop your jealousy, you would have already done it by now–wouldn’t you? How can Jealousy Coaching help? We’re the world’s leading experts on overcoming jealousy and we’re trained to help get rid of jealousy once and for all. In our work together, we help you see exactly what your jealousy issues and challenges really are (HINT: They’re usually caused by something different than you think they are) and then we spend most of our time giving you specific, actionable ideas, strategies and techniques for overcoming your jealousy before you destroy your relationship. We also help you to move beyond your jealousy and start creating the love and relationship you really want –one that’s full of love and connection and FREE from jealousy and help you start creating the love you want. What Happens in a Jealousy Coaching session? Coaching sessions are usually 60 minutes in length and can be done in person, by telephone or Skype, with you calling us at your scheduled time. All sessions are confidential and can be recorded for your use only. We may also correspond by email between sessions. During a typical session, we use personal stories, focused questions, and other various interactive ways of helping you to break through your “stuck” places that keep jealousy going in your relationship and life..
We are here to support you in your process and help you to achieve your goal of breaking free from jealousy and creating a relationship that’s healthy and filled with love. 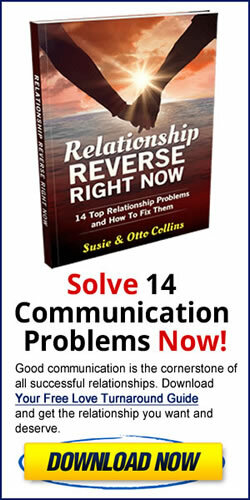 Why Work with Susie or Otto Collins as Your Jealousy-Stopping Coach? We’re two of the world’s leading experts in overcoming jealousy. We’ve been teaching about relationships since 1999 and have written over a dozen books on relationships. And… the fact is, we’re a couple of a select few relationship coaches who specializes on helping clients stop jealousy and are two of the world’s leading experts on overcoming jealousy..
Jealousy is one of those things that rears it’s ugly head and blocks the flow of love between you and your spouse or partner. Isn’t it time you get the help you need to get rid of it once and for all? The sessions are $125 for a one hour session and we offer a discount if you sign up for our “4 Session package.” The 4 session package price is $375. These charges are non-refundable. This means, with the 4 session package–it’s like paying for three sessions and getting the fourth one FREE. With the purchase of either package, you’ll receive our email love and relationships newsletter free of charge. You may unsubscribe at any time.